So on Friday night of Air City Expedition, many of us were hanging out in the game room, playing a game of Apples to Apples. It was a riot, if anyone's never played the game. We were enjoying the music styling of Professor Death and the Mostly Ghostly, the band that accompanies the Piscis Volans. After a some time, a lady in a pants-suit, clearly not of the convention walked up to the door. She said that she and her compatriots were very interested in "all this" and that we should join them and tell them all about it. I believe she mentioned drinks, which got us to go, but I doubt any of us actually got any, which is fine because of what happened next. We all mingled and hung about, many of us giving our own flavor of steampunk definition. What we had learned about the gathering was that these people were from Northeastern Industrial Automation of Waltham Mass. They and their boss, Drew, were having a retirement party for a gentleman named Gary. Glen of the M.I.S.F.I.T.S. consulted a few of us and decided upon having an impromptu panel of sorts. Glen stood upon a chair and gathered the attention of all the steampunks, musicians, and employees around. Gary was going to be steampunked. He had as much fun as we did with it. The whole room lit up with frivolity and they learned much about our community. 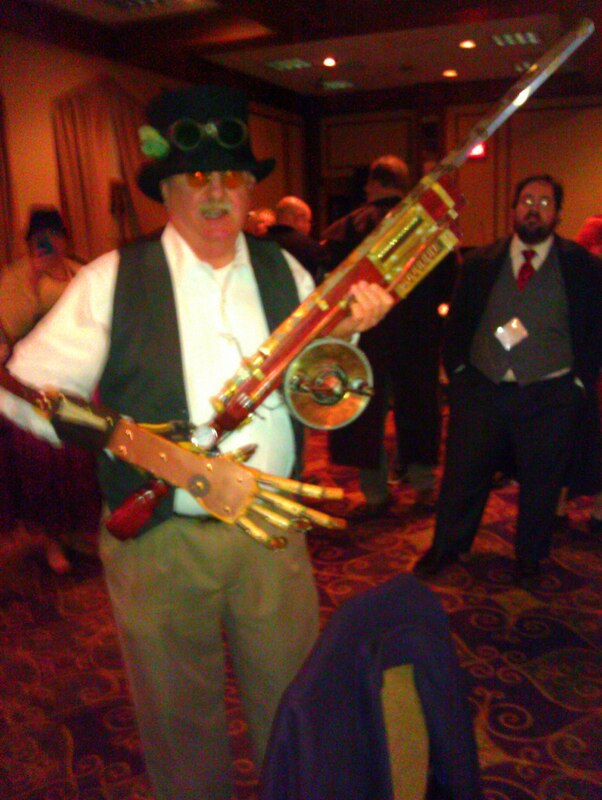 This is one of the most fantastic experiences I've had at a steampunk convention and it was completely off the cuff. We were such good guests at the hotel, that the other guests thought us approachable and interesting. We returned the courtesy and shared what we had, quite literally. I'd like to thank all the human beings involved in this, the impromptu panel. This made A.C.E. amazing for us, and the convention stayed on this wonderful high note the whole weekend.